Before the Summer is a distant memory I want to share this recipe with you. I have made it a lot over the summer and it is a bit of a life saver. It is so easy and quick to make, it’s perfect for picnics, hot days, or for days when you just want something light and fresh. This Mediterranean couscous salad has been the most requested lunch in my house over the summer, so much so that I’m going to keep making it for as long as I can. It has even gone done really well with our girl, so it’s kid approved. It’s perfect for packed lunches, be it school or work. It can be made the night before and kept in the fridge before you take it to school/work/uni. Or you could use it as an accompaniment to grilled fish or chicken. This Mediterranean couscous salad is made with whole wheat giant couscous but you could use regular couscous if you prefer, I like the giant whole wheat pearls as it has more substance to it. Which is good if you are serving this on it’s own for lunch. It’s great cold but you could serve it slightly warm too if you can’t wait for the couscous to cool down. I’ve eaten it both ways. 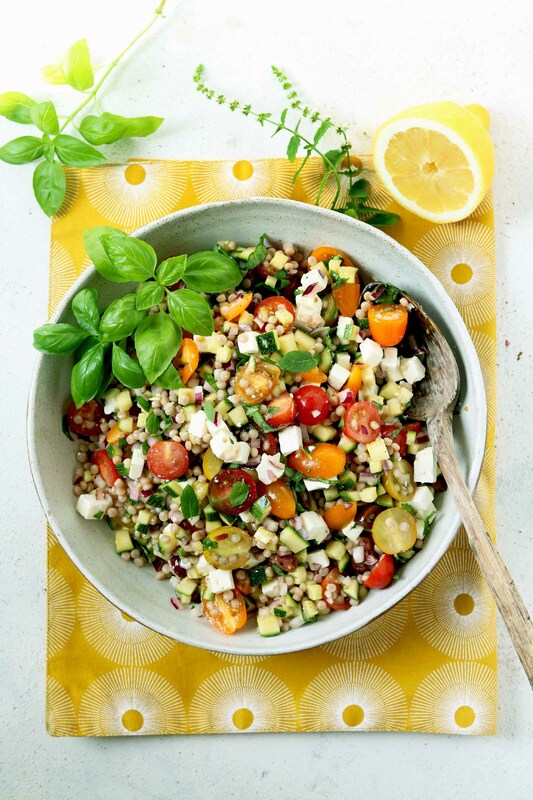 So I tend to use feta in this salad, I like the saltiness it adds and it works well against the tartness from lemon juice and the sweetness of the tomatoes. You could use a goat’s cheese instead if you’re not keen on feta or add your favourite vegan soft cheese to veganise it. My girl is starting secondary school next week (yikes!!) and although she plans on eating from the school cafeteria I think that the novelty will wear off quickly. She’s a real food lover and loves her home cooked meals, so we’ve been planning some lunch options that are a little bit more “grown up”. Cute sandwiches and fruit pots aren’t going to cut it for secondary school! Sigh! This couscous salad is on the list, which is great, it’s full of good things like whole grains, veggies, some protein and it tastes great so it should keep her going until she gets home. I’m hoping the rest of school lunches will be this easy! So, this Mediterranean coucous salad is great warm or cold, it’s really easy to make, it’s simple food at it’s best, my kind of food. It’s versatile enough that you could swap in your favourite vegetables if you wanted to and it’s cheap to make so would be a great recipe for anyone heading off to uni to have in their recipe tool box. A simple couscous salad with mediterranean flavours, easy to make and perfect for lunch. Heat the olive oil in a sautee pan, add the couscous and cook for about 3 minutes until the couscous is golden. Add 200ml of water and stir, once the couscous has absorbed the water add another 100ml + another 100ml and cook until the couscous is soft, about 15 minutes. Once cooked leave to cool. Add the vegetables and herbs to a large serving bowl and mix. Mix in the couscous once it has cooled then add the feta. In a jug whisk together the extra olive oil, lemon juice, garlic salt and pepper. Pour the dressing over the couscous and vegetables. Gently mix everything together. Serve on it's own or with some really good crusty bread. Love the combo of flavors here! I’ve actually never tried or cooked with the giant pearl couscous but I’ll have to get my hands on it! I’m sure this would make a perfect school lunch for your girl! This salad is representative of how we eat most days — lots of fresh flavors and colors — and I’m totally into pearl couscous, too! Beautiful photos! Wow! This is gorgeous and sounds so good. I can eat everything except the feat and I can’t wait! Kalamata olives add so much flavor! What a beautiful salad and beautiful photos. I just want to eat it now. Shared! Wow! I can see why this couscous salad would be such a big hit in your household. I looks so fresh and vibrant. Truly a beautiful dish. I’ll be interested in hearing how long your daughter lasts with cafeteria food. . .especially is she is so spoiled with eating tasty dishes like this.